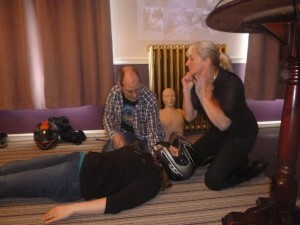 Considering that we at Leeds MAG ride in groups on a regular basis I felt it would be great to get some of our members trained up in basic first aid, with the emphasis on biking. 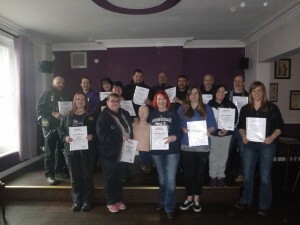 I know that some councils run free biker down training but there were none local to us and I felt that we’d get a better response if we could get a trainer to come to us and at £15 per person, it wouldn’t break the bank. Step forward Judy Richer of Train Aid Inc.
Judy has years of experience in first aid training in areas as diverse as aviation first aid, the building trade, equestrian and obviously motorcycle first aid. We provided the room for the training and I corralled 15 willing volunteers to attend the 3 hour course one Saturday morning in April. It was great fun, with a mixture of hands on training and power point slides to get the vital messages across. I’d like to think that if the worst were to happen on a Leeds MAG ride out, at a rally or just in every day life, we’d be in a situation to help rather than hinder the situation. If any groups want to contact Judy to arrange your own biker down course, she can be contacted at judy.trainaidinc@gmail.com.